I took a very nice self-guided tour of the grounds and mansion. I think my favorite thing was the writing desk in the upstairs hallway/waiting area. I can just imagine someone writing at that desk (or a similar desk) in this house back during hayday of the Howell Works company. I also got a significant tutorial at the wood shop. Did you know that a number of the things made back then were first made in wood, molds were made, and then iron was poured to make the shape? If you did, you knew more about it than I did prior to visiting. Definitely a place worth taking a solid look at. I'll be going back again in the not too distant future. So despite living in the area for quite a while, I hadn't been to Allaire State Park for year. And definitely a lot earlier than that in terms of going into all the historic buildings. I wish I had been able to get more time to poke around but my kayaking time ran a bit long. Needless to say I will definitely be back to get some more photos and see all the buildings inside and out. It's so close that it would be a shame not to! Email from our finder, M: "Hi! This is a picture of your crane, Which i found on a trip with my daycampers to allaire state park. It really brought a smile to my day. I am a great origami lover,and it was cool that i found number 613 , since i am jewish and 613 is a meaningful number in judaism (its the number of mitzvot- commandments). I love your project and think its a great way to get people thinking. 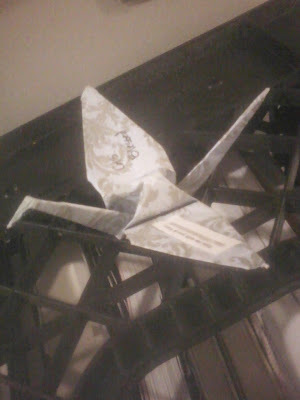 For now, the crane is resting on my book crates, but i plan on rereleasing it soon. Good luck! - M"
Thanks for the lovely email and keeping 'Blessed' safe!